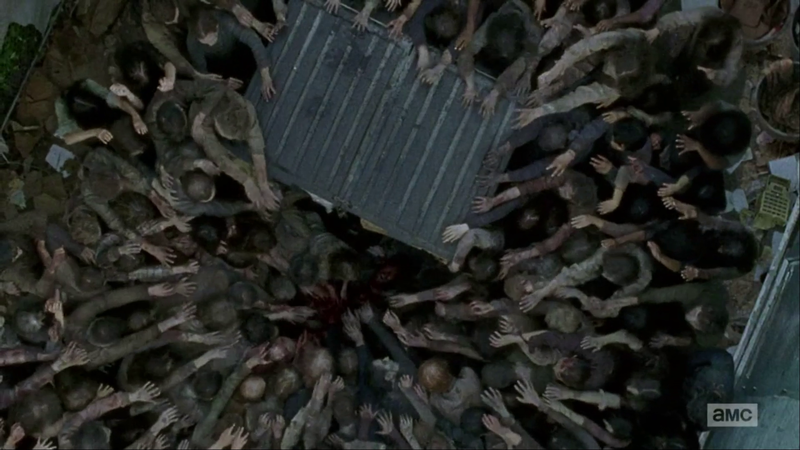 Above is one of the promotional images released for Season Six of The Walking Dead, months before the first episode was set to air. At the time, this looked like any other poster mockup and nobody gave it a second thought. Do you recognize it NOW? More on that in a few paragraphs. 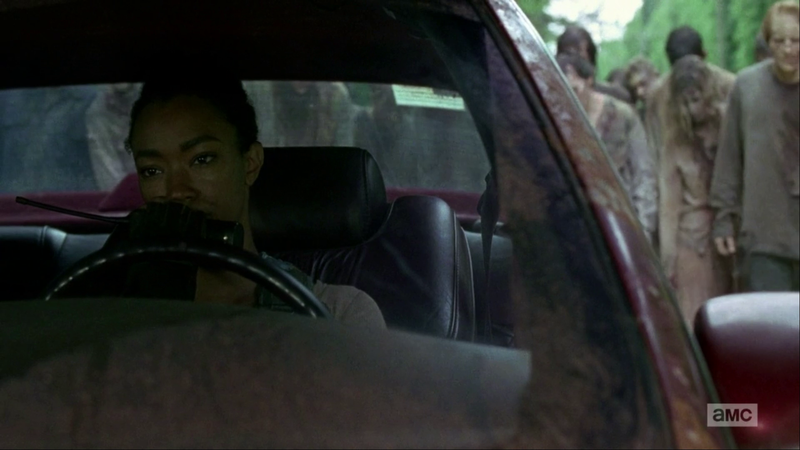 This episode began right where Episode One kicked off, when the horn started blaring and the zombie herd started turning back. The only good news is that half of the herd was out of range to hear the noise and stayed in line, so it could have been worse. 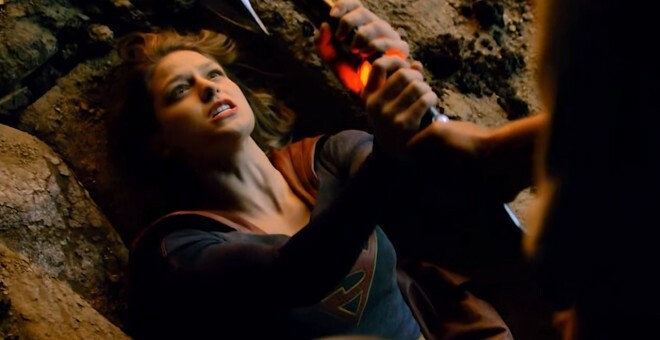 But it’s enough to trample the city under the feet of the dead, and now most of the gang has to beat a path back to Alexandria to warn everyone and try to save as many lives as they can. 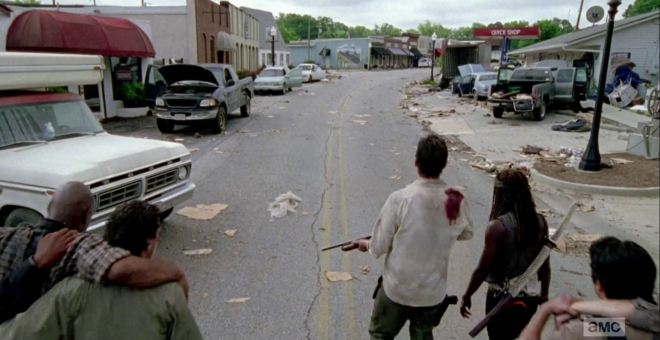 Rick runs off separately to get the RV. 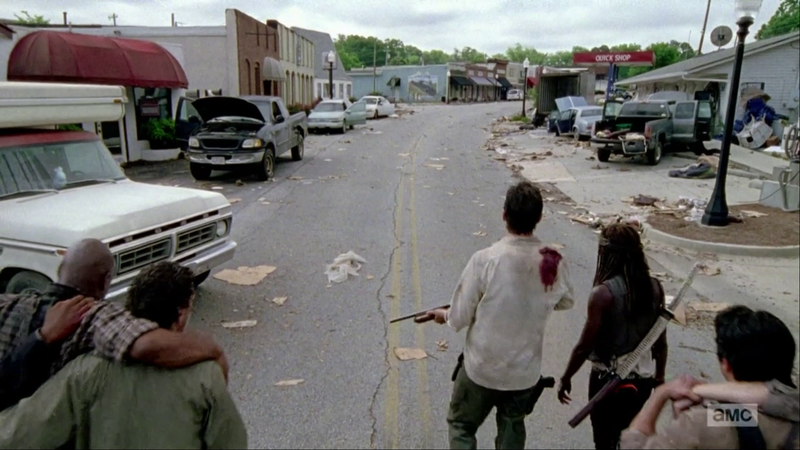 Eventually they reach a street they recognize as the halfway point between their original distance and Alexandria. 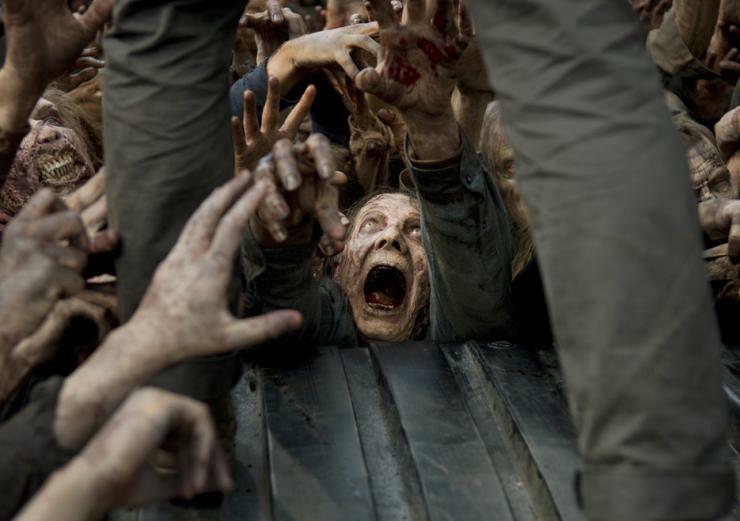 There are unfortunately a few Walkers to deal with, but there are going to be a lot more. 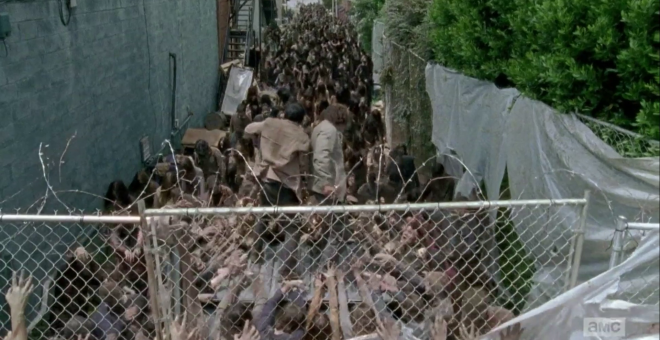 According to a random Alexandrian who probably died ten minutes later, the zombie herd is a half-hour away from them. Fortunately, they find a few cars abandoned on the street. They’ve got to jumpstart them quick and get out of here! …or they could go hide in a pet shop; that’s also a choice. The deeper our cast slides into this dookie sandwich, the more I think about that quarry and how they could have used the flare gun to set a fire that would have burned all the zombies up. Not a single one of them seems to have thought back to that scenario and realized this. And then they prioritize hiding instead of hotwiring. While making dumb decisions is a hallmark of horror movies, this isn’t your average horror show, and plenty of these characters should’ve been smart enough to handle this better. 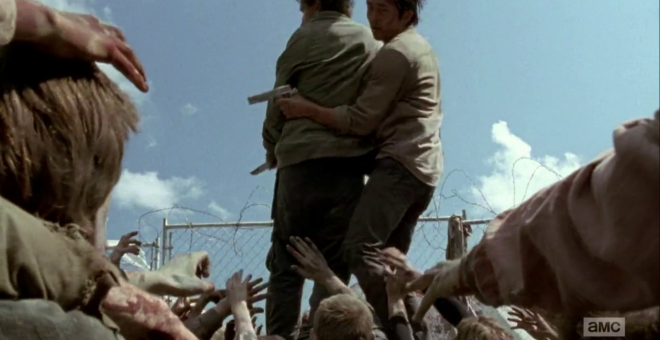 We get a brief look at to confirm that, yes, Daryl, Abraham and Sasha are still on the original path and their half of the herd is still in check. 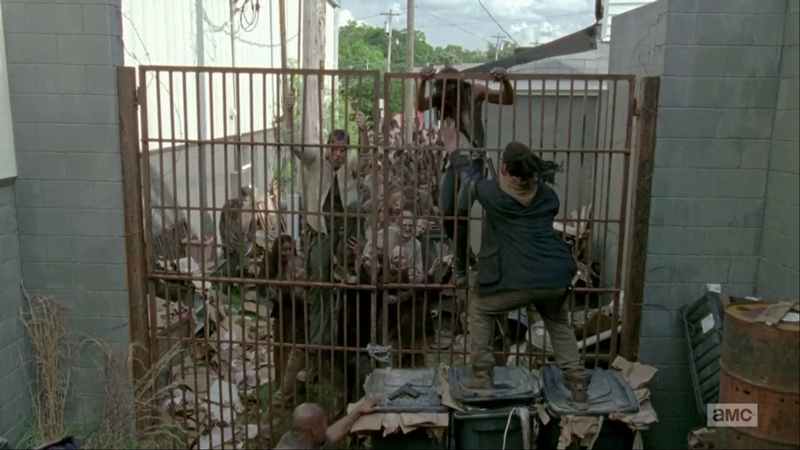 It’s occurred to me….when these guys get far enough that they’ve led the zombie horde a safe distance away, what then? How do THEY get back? Their only methods of transportation are the things that have been creating the noise that’s led those guys here. This isn’t another “whoops, didn’t think that through” in the making, is it? We’ve lost so many; we can’t lose any more. 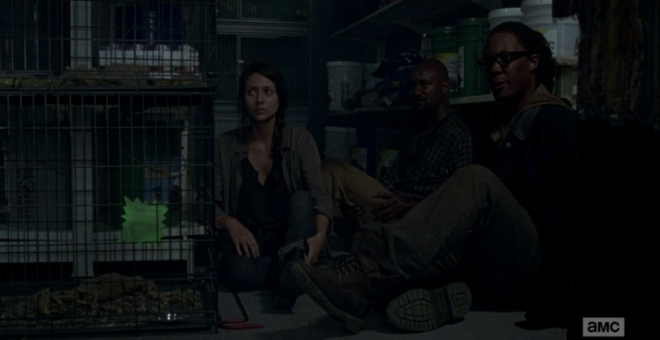 While hiding in the pet shop and trying not to make noise, an Alexandrian shows Michonne his cash register receipt paper ribbon that has his dying words on it, to be delivered to his wife Betsy if he doesn’t make it. 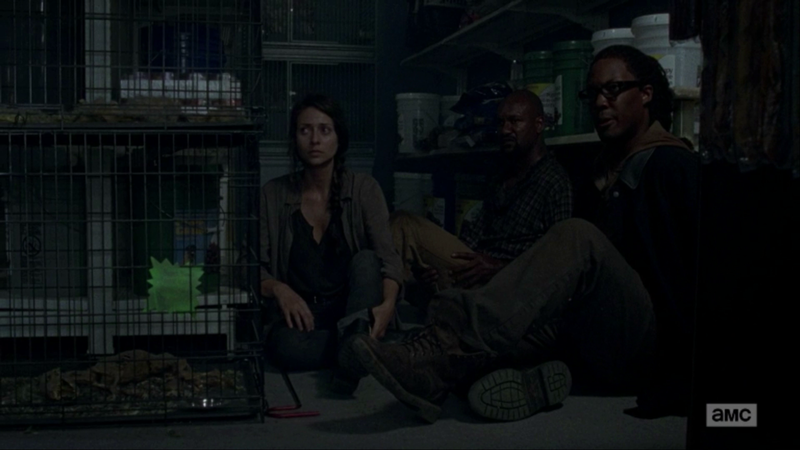 Michonne assures him “no way, you’re gonna make it, I’ll make sure of that.” What she doesn’t realize is they’re going to waste their entire getaway time in this stupid shop, and about a minute from the herd’s arrival, some Walkers are going to get into the storage room and start banging things around. 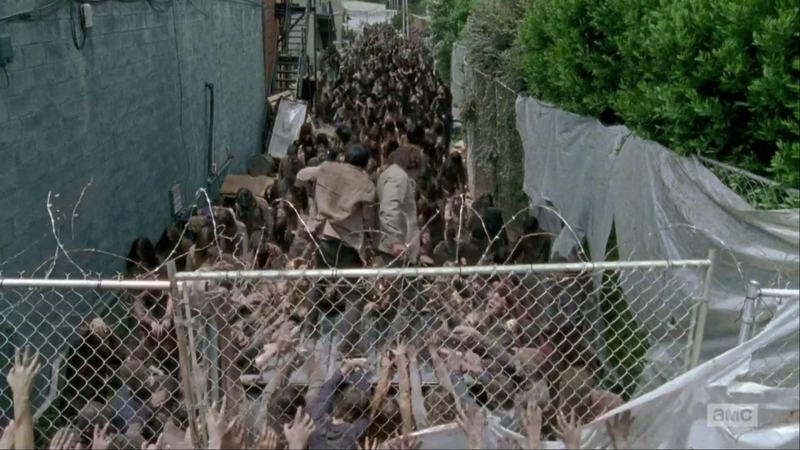 This forces the survivors to kill them, which in turn makes more noise, which attracts MORE Walkers….and then the herd arrives. They escape into the street; the Alexandrian with the wounded leg is the first to go. The remaining players race into an alley and climb a fence, but they can only scale it one person at a time and the herd is quickly boxing them in. 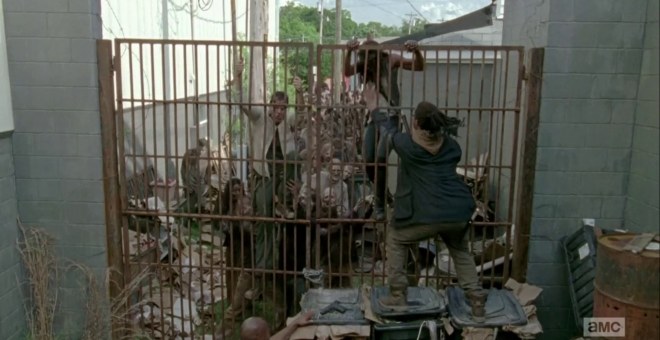 The zombies arrive as Michonne and the guy with the note are halfway up the fence, and as they start clawing at their legs, Michonne gives them each a mighty Michonne Kick and succeeds in climbing over. Note Guy is not as fortunate and is the next one to be chomped. While this has been going on, Glenn and Nicholas have been out on a mission to set a fire as a distraction. They get blindsided by the herd and rush into an even worse corner than the rest of the gang did. 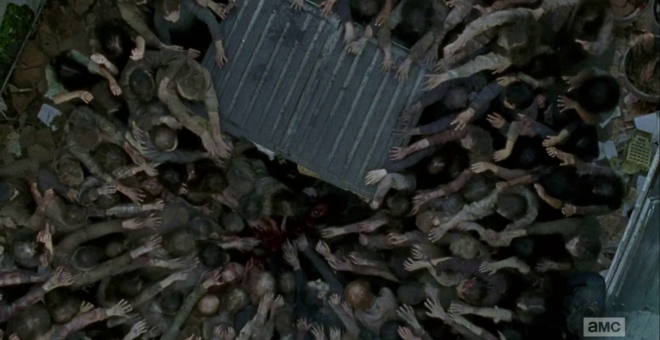 In seconds, Glenn and Nicholas are trapped on the top of a garbage dumpster surrounded by about 5,000 biters, with no visible method of escape. —wait, what is he doing? Don’t lean that way! Don’t lean THAT way!! WHAT?!? NO!! ARE YOU SERIOUS? NO!!! The biggest proof the conspiracy theorists can offer forth is that Steven Yeun has been spotted on set, filming roles in episodes after this one. It’s a good point…BUT. 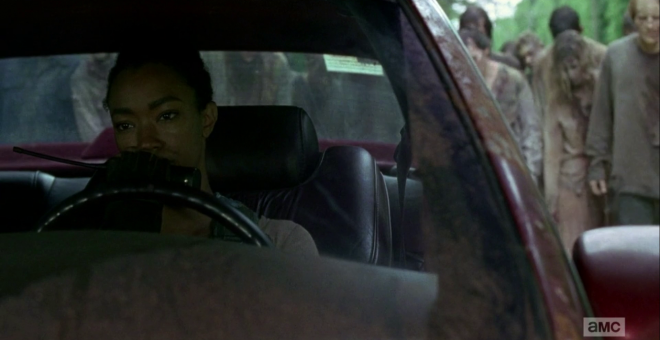 The Walking Dead is one of the few shows that’s aware that our hyperconnected society has the ability to sniff out any clues that exist. It’s not implausible that they’ve kept Yeun on set all this time just to create the illusion nothing happens to him. 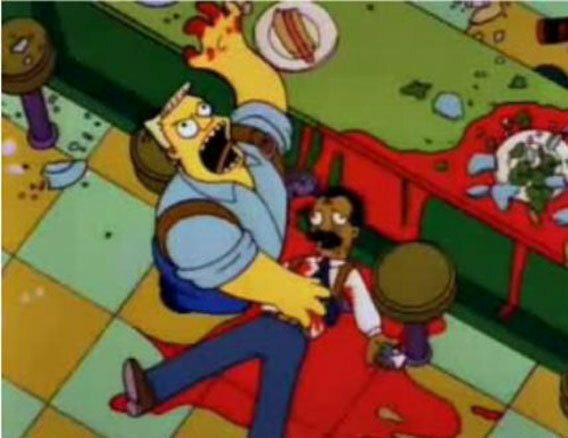 And yeah, he could have also crawled under the dumpster, but it wouldn’t protect him for long. Rick embodies the frustration of a lot of viewers at this point. We’ve suffered a big loss, yet we’ve still got ten minutes of show to sit through, and we’re in no mood for any more of this crap. 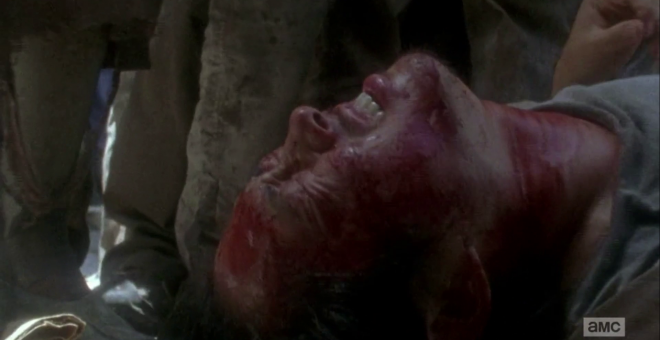 So when Rick is attacked from behind by some Wolves, the absolute beating they get from him is somewhat therapeutic. 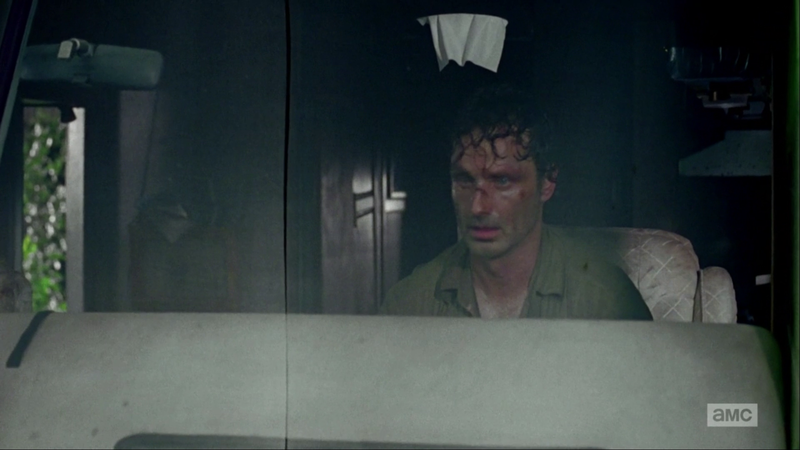 Then Rick notices a few more of them coming up the side, and he fires through the RV wall. 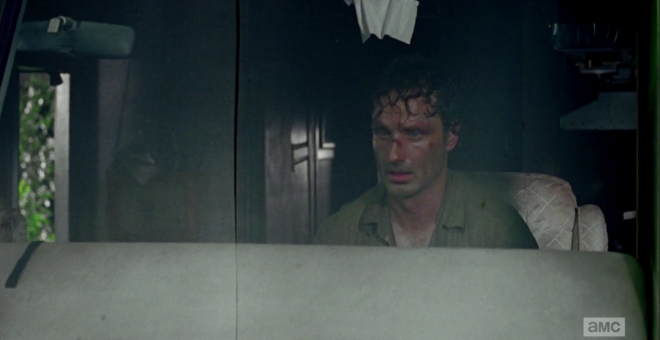 We don’t even see these people beyond a reflection, and then they’re dead. He’s that mad! 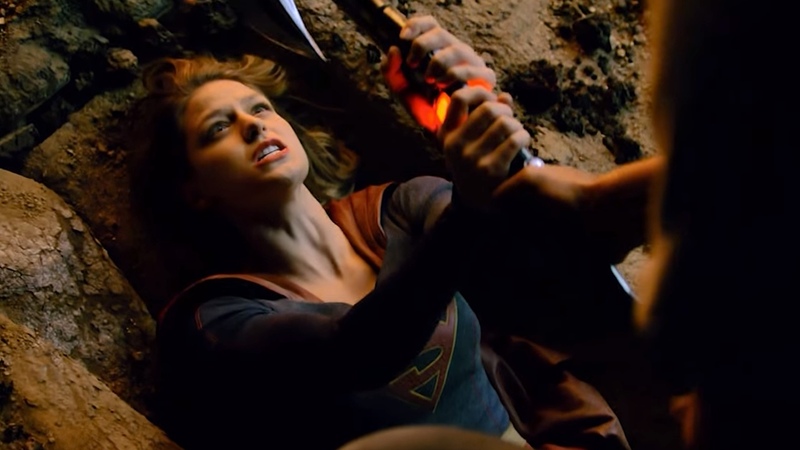 This may be an apples-and-oranges comparison, but…I have my doubts Supergirl will ever get this intense.